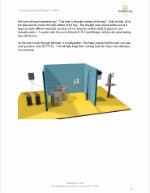 You have operation manuals for servers, bartenders, bussers, hosts, line cooks, dishwashers,…. You need an operations manual for your draught system. After all, it is your biggest selling beverage item. 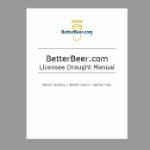 How is this different than other Draught Manuals available on line? It’s not full of technical jargon. 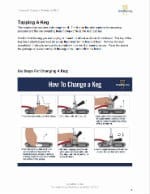 We’ve heard it time and time again that other manuals are written for draught service technicians and brewers. They are great manuals, but your staff won’t understand them. 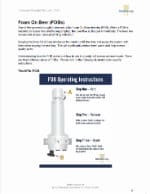 Your staff doesn’t need to know how to calculate the restriction when installing a draught system or how to reverse beer pumps when line cleaning with a recirculating pump. Our manual is written by a former restaurateur, for restaurateurs, in simple, restaurant language. Written by Steve Riley who was in the business as a Bar Manager and General Manger for several years and who was on the opening team of many restaurants. Steve is a Certified Cicerone™ and the guy behind BetterBeer.com. And he’s been in your shoes. 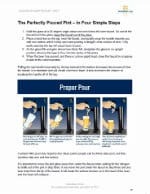 Used by several chain restaurants as their go-to draught resource, this manual is a must have if you sell draught beer. Where else can you get a restaurant manual for only $59? Click here to check out the Draught Manual's Table of Contents. Download yours right now. You can download it, print it, and have it in your staff's hands within the next three minutes. Too easy. Buy 12 or more and we'll put your logo on it as well. NOTE: Manual is a pdf file that will be available to you immediately after purchase.